As we approached the 1970's, the way that Blues was being presented to Britain's record-buying public was undergoing a few changes. Gone were the copious sleeve notes where serious-minded cognoscenti explained mysterious words like “mojo” to the uninitiated, or where personalities like managers and disc jockeys indulged in amusing flights of fancy. 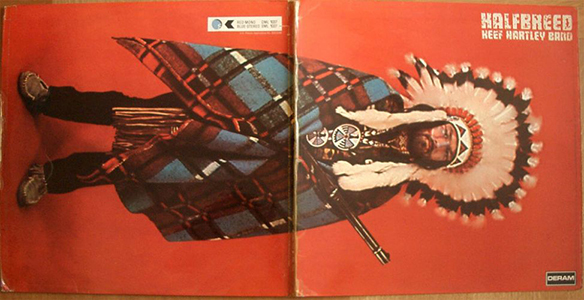 Now we knew (roughly) what a black cat bone or a John The Conqueror root was, the music was being encouraged to speak for itself, and in came lyric sheets and colourful gate-fold sleeves - few more colourful than the one adorning this Classic Album, where Lancashire's own Keef Hartley appears in full American Indian regalia, complete with warpaint and shotgun. 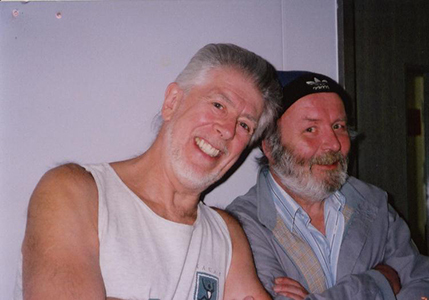 John Mayall - voice on "Sacked" and "Too Much to Take"
Keith “Keef” Hartley had already paid his dues as a drummer, replacing Ringo Starr in Rory Storm's hard-working Liverpool group The Hurricanes, then joining unpredictable comedian Freddie Starr's band The Midnighters, playing long sets in Hamburg's notorious Star Club. Keef went on to join organist Jon Lord in The Artwoods, led by the eponymous Arthur Wood, whose brother Ted was vocalist in The Temperance Seven, and whose other brother Ronnie then played guitar in a little known band called The Birds. (How times have changed!) The Artwoods signed to Decca in 1964 and debuted with a cover of Huddie Leadbetter's 'Sweet Mary,' before making an album titled 'Art Gallery' produced by Decca staffer Mike Vernon, and engineered by Gus Dudgeon. Hartley was sacked from the band for a “dress code violation,” commenting later, "I didn't like their music or their daft little suits." But his connection with Vernon led to plenty of work - joining Bluesos like Eric Clapton, Tony McPhee, Peter Green, Mick Taylor and John Mayall, he played on countless sessions for visiting American Bluesmen, such as Little Walter, Champion Jack Dupree and Jimmy Witherspoon. His first opportunity came in response to a call to Mike Vernon and Neil Slaven from Marshall Chess. Neil recalled, “Marshall was keen for Chess to keep pace with the move from straightforward R&B to a more progressive sort of Blues. He'd heard the stuff Mike had produced and was looking for something similar. Keef quickly put a band together consisting of himself, Gary Thain, Paul Rogers and Paul Kossoff. They went into the studio and finished about 3 tracks. These were sent over to the States, but nothing came of it.” Sadly, these tracks have never surfaced, as I'm sure they'd make very interesting listening. Undeterred, Keef pressed on to put together another line-up. Following him came keyboard player 'Dino' Dines, from Hertfordshire band The Little People. Having landed a gig supporting The Small Faces, they had so impressed Steve Marriott that he suggested them to Andrew Loog Oldham for his Immediate record label. Oldham liked everything about the band except for their name, and so they became "Apostolic Intervention" and recorded a Marriot/Lane composition (featuring little Stevie on bass) called “(Tell Me) Have You Ever Seen Me,” which unsurprisingly sounds rather like a Small Faces out-take. Finnegan was very briefly replaced by Sam Holland, but that didn't work out either, and while a flustered Neil Slaven negotiated with Deram for two weeks' grace, auditions were held that unearthed the undeniable talents of Scotland's Miller Anderson. Although he represented himself “really just a guitar player,” he was quickly taken on as the band's “lead gob.” In two days, the vocals were completed (allegedly with the approval of Tom Jones, who was recording on the same day) and hearing the final cuts, executive Hugh Mendel extended the contract to an eight-album deal. More astonishing, considering that Anderson didn't have any choice over what keys the songs were pitched in, and had to sing them as he found them, further proof of his ability and versatility. Here's the L.P.
1d) "The Halfbreed.” Softly plucked guitar and a roll of toms lead into this compelling 12 bar instrumental. Credited to Harley, Cruickshank and Dines, the sequence is similar to Ben Tucker's "Comin' Home Baby" recorded first by the Dave Bailey Quintet in 1961, then shortly after by Herbie Mann, and in vocal form by Mel Tormé. There's Hammond riffing, and lead guitar with a somewhat Santana-like flavour, smooth and overdriven but with bite and some very strong vibrato. I see "Spit" pictured with a Gibson SG, and that sounds about right to these ears. Stabbing brass punctuates, drums rattle, and a very moody organ solo follows. Keef subtly runs through different rhythmic patterns without upsetting the flow, taking a turn round the tom-toms during the final guitar solo, then bringing the beat onto the snare as the brass returns and the piece fades. Very enjoyable. Trk. 2) "Born to Die" is credited to Dines, Hartley, Thain, and Fiona Hewitson – Miller Anderson writing under his wife's name for contractual reasons. Hymnal Hammond and thoughtful guitar open this slow Blues, which benefits from a chord sequence differing from the usual straight twelve. Anderson's voice is at once strong, expressive and questioning as he bewails his situation. Tuneful guitar fills which are drenched in reverb during the verses give way to a very lyrical and understated solo from 'Spit,' which over the course of four rounds, slowly escalates to a fiery pitch. The band sympathetically builds up with him, but never dominates, and the sounds are rich and warm. Everything drops down to a whisper for the last verse, then another chromatic turnaround on the outro swells to a powerful climax with pounding percussion, as the track slowly fades. Ten minutes of Blues heaven. Trk. 3) "Sinnin' For You." Finnegan's name still gets a mention in the composing credits, along with Hartley, Dines and Hewison. This track fades in with an ascending Hammond sequence, Keef's drum-beats furiously building up the tension, until it suddenly snaps into a straight-ahead shuffle, with every verse completed by a deliciously fugal brass figure. Anderson's strong, positive voice shows him to have been the right choice. Cruickshank's forceful guitar works out on a one chord boogie, with riffing horns breaking in and adding to the excitement, before returning to the ascending sequence of chords and working its way back into the verse. Gary Thain delivers some particularly tasty, driving bass work, always changing his approach without losing any impact. The outro returns to the ascending chord sequence, repeated over Keef's constantly shifting drum patterns, with a delicious breathy flute solo before the fade. Probably the most outstanding track on a great LP. Trk.1) is an updating of Sleepy John Estes' "Leavin' Trunk." In post-Hendrix fashion, the introductory guitar riff is panned back and forth from left to right, while the drums build their way into this funky re-arrangement, with offbeat bass and rhythmic, piping organ. Anderson's voice is strong, and though two guitars vie for attention on the one-chord solo, legend has it that are they both Cruickshank's. At the end of the solo, the intro riff is reprised, and Anderson brings it home, until – Surprise! The band stops, the riff restarts, and Keef brings the tempo back in on an unexpected swing beat, just in time for the fade. I wouldn't have minded a bit more of this, too. Trk. 2) "Just to Cry." Henry Lowther and Owen Finnegan are honoured as creators of this most unusual piece. A single repeated bass note begins the tune, accompanied by a warm Hammond and a hauntingly hypnotic trumpet riff. When the vocals begin, Keef keeps the rhythm lightly ticking over on hi-hat, rather than pushing it forwards, and Anderson's voice captures the mood of sadness and resignation. A sudden, choppy, accentuated middle 8 runs out into some smooth jazzy chords, then a light guitar solo, saturated with wah-wah and echo, sets a dreamy, semi-psychedelic mood before the verse returns. After a repeat of the unconventional middle eight, there's a trance-inducing fade-out with double-tracked trumpet. Excellent, and completely different. Young Ian Cruickshank, aka 'Spit James' is plainly a bit of a discovery, and rather the star of the album. Although his sound and approach are starting to edge slightly more into Rock territory, it doesn't detract from his powerful and captivating improvisations, and he can deliver some very tasty straight-forward Blues licks when he wants to. The one-chord solo seems to be a little too much in favour on this album, but there are some terrific dynamics, with great highs and lows. I could have taken some more Hammond, for the little soloing there is, is very strong indeed, but 'Dino' seems to be relegated to a backing position more often than not. Thain's bass work walks a fine line between being just enough to hold things down, and no more than enough to drive them. It's never overplayed, and always works beautifully with Hartley's drumming, which comes (quite rightly) well to the fore in some parts of the arrangements. Hartley's drums take their 'solos' like a guitar or organ, that is to say, while the rest of the band is playing, which is a very different, and (to my mind) extremely successful approach, far more listenable than drum solos which occur while the rest of the band is silent. Miller Anderson, though belatedly found, turns out to be just the man for the job, and indeed for many jobs after this, for he's had a long and varied career. Strangely, I've read more than one internet comment saying what a great Blues/Rock album this would be, if it wasn't for that darn brass spoiling it, which is rather missing the point. There's a Jazzy influence, and some creative arranging, in the unconventional chord sequences and timing changes which make the album such fascinating listening. The band's never content to stick with the same old thing, and there's plenty of variety, inventiveness, light and shade. If you were of a mind, I suppose you could classify it as a Blues/Rock/Jazz/Psych fusion. 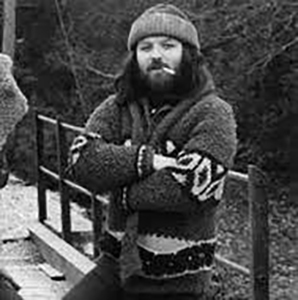 Neil Slaven, in his sleeve notes for Savoy Brown's 'Getting To The Point,' wisely predicted "Having served an apprenticeship in Blues, the band will soon be getting to the point where they will start to create their own music in their own context..." and the same applies here to the Keef Hartley Band, and this undeniable Classic Album of British Blues. 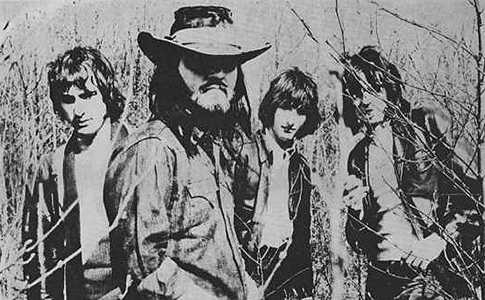 Of the original band members, Gary Thain went on to join heavy metal band Uriah Heep, but suffered an electric shock on stage from which he never fully recovered. Unable to continue with the band, he became addicted to heroin and died of an overdose at the untimely age of 27. Peter 'Dino' Dines and Miller Anderson both joined Marc Bolan's backing group, which lasted until Marc himself died tragically in a car crash just before his 30 th birthday. Dino then went on to work with Bolan tribute band T Rextasy before he died of a heart attack in 2004 aged 59. Keef Hartley carried on playing, leading bands and doing sessions, but eventually found himself in constant physical pain from the drumming – a similar fate has befallen Ginger Baker – and had to wear a neck brace. He went into retirement from music in the 80's, working as a cabinet maker, and died of complications arising from surgery, aged 67, in 2011. Ian Cruickshank made two albums with Keef before leaving after 18 months, completely disillusioned with the music business. He's now a jazz guitarist and as he says “some kind of authority on Django Reinhardt.” He owns and manages the independent 'boutique' label, Fret Records, which specialises in Gypsy Jazz. Miller Anderson has soldiered on to play a part in The Miller Anderson Band, Hemlock, Savoy Brown, Blood Sweat and Tears, Dog Soldier, T Rex, The Dukes, Stan Webb's Speedway, Chicken Shack, Mountain, and The Spencer Davis group, to name but a few. In July 2016 he released a new album of 12 original tracks called “Through The Mill” and doesn't show any signs of slowing down yet. Long may he run.